J. Craig Williams, the founding partner of WLC | The Williams Law Corporation's Orange County, California office, focuses his practice in the areas of complex business litigation with emphasis on environmental, intellectual property, real estate, technology law and their respective insurance coverage and related tort issues. Mr. Williams also handles white-collar criminal matters for environmental contamination, and has a select personal injury practice. He is a Top-rated Criminal Defense Lawyer - White Collar Crime, as chosen by American Lawyer Media and Martindale-Hubbell. 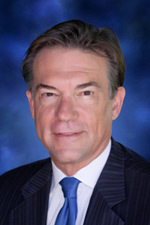 He holds Martindale-Hubbell's highest possible AV rating, in both legal ability and ethical standards, and is listed in the Bar Register of Preeminent Lawyers, has been named a SuperLawyer every year since 2007 and rated 10 of 10 by Avvo.com. For 2013, SuperLawyers named Mr. Williams as one of the Top 50 Lawyers in Orange County, California. Mr. Williams is both a Board Certified Civil Trial Advocate and Board Certified Civil Pretrial Practice Advocate, certified by the National Board of Trial Advocacy, an American Bar Association and California State Bar approved agency. Mr. Williams is admitted to practice law in California, Washington, Iowa and Massachusetts. He is presently the President of the Orange County, California Celtic Bar Association. Mr. Williams’ experience includes practice at nationally recognized law firms and has appeared as lead litigation counsel in numerous states and federal districts. Mr. Williams is admitted to practice law in California, Iowa, Massachusetts and Washington. He is admitted to practice in all California state courts, the United States District courts - Northern, Central, Eastern and Southern Districts, the United States Court of Appeals for the Eighth, Ninth and Federal Circuits, the United States Court of Appeals for Veterans Claims and The Armed Forces, the United States Court of Federal Claims, the United States Tax Court, and the United States Court of International Trade. In addition, he is admitted to the United States Supreme Court, sponsored by W. Ward Reynoldson, Chief Justice of the Iowa Supreme Court. Mr. Williams is currently a member of Law Technology News editorial board, Internet Bar Association, Bighorn Institute board of directors, Authors Guild, Legal Writing Institute, Defense Research Institute, Association of Southern California Defense Counsel, Association of Business Trial Lawyers, California Bar Association, Iowa Bar Association, Washington Bar Association, Massachusetts Bar Association, Orange County (California) Bar Association. Mr. Williams has served on the Avvo.com Advisory Board and the Orange County (California) Bar Association Board of Directors and been a member of the Defense Research Institute, Association of Southern California Defense Counsel and the Association of Business Trial Lawyers. An accomplished speaker, Mr. Williams has lectured as an adjunct professor at the University of Iowa College of Law on Trial Advocacy, Stanford Law School on Environmental Insurance Coverage, Chapman University School of Law on Legal Writing and Research, the University of California, Irvine on Toxics Law, and the UCI Extension Environmental Management Program on The Regulatory Framework for Hazardous and Toxic Materials. He has published How to Get Sued: An Instructional Guide, a hardcover book, with Kaplan Publishing, and his second hardcover book from Kaplan, Bad Decisions? 10 Famous Cases That Went Wrong is anticipated to be published in 2014. He also wrote the Foreword for the reissued hardcover book, The Path of the Law by Oliver Wendell Holmes. He was a contributing reporter on environmental litigation of the “ABA Real Estate Quarterly Report,” and is the author of many articles, including “Defense of Environmental Criminal Cases By the Numbers of Science and the Law,” Vol. 22, Issue 10, Andrews Litigation Reporter, White-Collar Crime, Thompson West, July 2008; “The Liabilities of Social Networking Sites,” 50 Orange County Lawyer, June, 2008; Co-Author of “The Practical Implications of the Aerojet Decision, California Environmental Law and Remediation Reporter,” April 1998; and, “Son of the California Environmental Quality Act: A Look at Public Resources Code 21081.6,” 33 Orange County Lawyer 36 (1991). Mr. Williams has participated in numerous appellate court opinions, including the 2006 O'Grady v. Sup.Ct. (Apple Computer) 139 Cal..App.4th 1423. Mr. Williams was featured in the April 2009 Orange County Lawyer Magazine in their “Who’s Who in the OCBA” article. Additionally, he was honored in OCMetro Magazine’s “O.C.’s Top Lawyers” in the area of litigation. Selections were chosen based on Avvo ratings of which he has a perfect “10” and peer reviews. He also received a Pro Bono Publico service commendation from the Washington State Bar Association for performing over fifty hours of service for the public good in the past year. Mr. Williams and his wife, Christine, wrote a children's Christmas book, The Sled, for their grandchildren, who are the named characters in the book, which was published by Crimson Cloak Publishing. He has published How to Get Sued: An Instructional Guide, a hardcover book, with Kaplan Publishing, and his second hardcover book from Kaplan, Bad Decisions? 10 Famous Cases That Went Wrong is anticipated to be published in 2014. He also wrote the Foreword for the reissued hardcover book, The Path of the Law by Oliver Wendell Holmes. Mr. Williams also enjoys skiing, scuba diving and spending time with his dogs. His 2017 entry of his Grandmother's peanut butter cookie recipe won second place in the National Orange Show open cookie contest. Mr. Williams is an apprentance falconer with Sky Kings Falconry and a hobbyist beekeeper. Mendez-Carmona v. Saxon Mortgage Services, Inc. (Ca.Ct.App., 4th App.Dist., Div. 3, filed February 18, 2011), No. G043420 (Unpublished opinion). Harper v. NewMark Merrill Cos. (Ca.Ct.App., 4th App.Dist., Div. 2, May 14, 2010), No. E046683 (Unpublished opinion). Mr. Williams has presented numerous seminars over the years. The following are some of his presentations since 2000. “Update on Legal Technology,"Orange County Newport Beach and Celtic Bar Associations, Porto, Portugal, October 2018." “Protecting your Law Office against Malware, Ransomware, Viruses and other Technical Difficulties,” Orange County Celtic Bar Association, Reykjavik, Iceland, October 3, 2017. “First Amendment, Free Speech and Communication Controls,” Los Alamitos Chamber of Commerce, Los Alamitos, California, July 11, 2014. “Can Tech Save Fuel Small Firms?”, LegalTech West Coast 2014, Los Angeles, California, June 24, 2014. “Mediation of E-Discovery Disputes,” Judicate West, Santa Ana, California, February 10, 2014. “The IT has hit the Fan: Send Lawyers, Guns and Money,” 28th Annual ISSA SoCal Security Symposium, Long Beach, California. October 30, 2013. “Interface Between IT and Lawyers,” Information Systems Security Association - Orange County, Irvine, California, May 9, 2013. The Rise of Co-Created StoryWorld Communities," SXSW Conference, Austin Suite, Austin, Texas, Sunday, March 11, 2012, 3:30-4:30 p.m.
How to Get Sued book signing at Book Expo America, Los Angeles Convention Center, Los Angeles, California, June 1, 2008, starting at 11:30 a.m.
"Ethical Considerations for the Environmental Practitioner," Green Building Conference, CLE International, San Francisco, California, February 21-22, 200. The Sled, J. Craig Williams and Christine B. Williams, authors, and Amelia Bernstein, illustrator, Crimson Cloak Publishing, July 2017. Lawyer2Lawyer podcast on the Legal Talk Network, J. Craig Williams, August 31, 2005 to present (formerly "Coast to Coast"). Bad Decisions? 10 Famous Cases That Went Wrong, pending publication. Mr. Williams attended the United States Coast Guard Academy, New London, Connecticut, from 1975 to 1976. He completed his undergraduate work at James Madison University, Harrisonburg, Virginia where he received his B.S. (1979) with a major in Communications Arts – Radio, TV, Film and Journalism and a minor in Biology as a member of Omicron Delta Kappa. He received his J.D. (1987), from the University of Iowa College of Law, with distinction. While at law school, he served on the Moot Court Board and was a Certified Practicing Student Clerk where he handled a criminal jury trial, argued before the Court of Appeal and briefed a matter before the Iowa Supreme Court. Top Attorneys of North America, 2014 Edition - current. Fellow, Litigation Counsel of America, June 2015 - current. Invitation-only award given to the top 1/2 of one percent of North American lawyers, judges and law professors. Superlawyer, Superlawyers Business Edition, 2015 - current. Top Lawyers in California for Highest in Ethical Standards and Professional Excellence. The Legal Network, 2014 - current. Top Attorneys in Orange County, Orange Coast magazine, February 2013 - current. Top Attorneys in Southern California, Los Angeles magazine, 2012 - current. Superlawyer, Los Angeles Magazine, 2006 - current. Attorneys of Distinction, Orange Coast Magazine, November 2014 - current. O.C. 's Top Attorneys, OC Metro Magazine, September 2014 - current. America's Most Honored Professionals, American Registry, June 2014 - current. Latinio Who's Who, June 2014. Top 50 Lawyers in Orange County, California, Superlawyers 2013 - current. Board Certified Civil Pretrial Practice Advocate, National Board of Trial Advocacy, an American Bar Association and California State Bar Approved Agency, 2010 - current. 10.0 Superb, Top Attorney rating by Avvo, 2007 - current. Board Certified Civil Trial Advocate, National Board of Trial Advocacy, an American Bar Association and California State Bar Approved Agency, 2006 - current. AV Preeminent Attorney, Highest possible rating in both legal ability and ethical standards, Martindale-Hubble, 2004 - current.